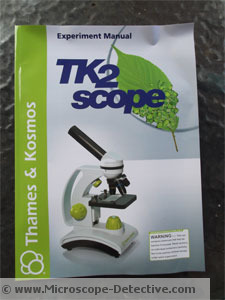 If you're on the hunt for a microscope for kids that works well, offers lots of great experiments, and isn't outrageously expensive then look no further than the TK2 Scope by Thames & Kosmos. More than just a toy, the TK2 Scope is an entire experiment kit. We purchased one ourselves to put through the wringer and liked what we found! 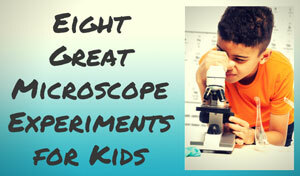 One of the things that sets the TK2 Scope apart from other microscopes for kids is the 48-page experiment manual. The manual goes far beyond just telling you how to use your microscope; it proposes over 20 experiments to help kids learn about the fun and fascinating world of microscopy. 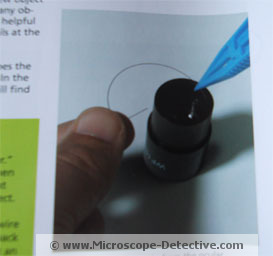 One could run their own little microscope course for kids based off of the manual alone. Of course a manual itself doesn't make a microscope kit great, but high quality optics, sturdy construction, ease of use, and helpful included accessories certainly do! 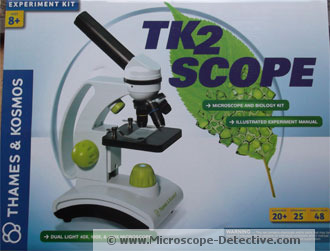 After using this kit, I felt that for features versus cost the TK2 microscope for kids was one of the best on the market. 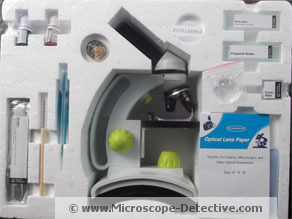 True it is priced higher than our other top recommendation, the My First Lab Duo Scope. Yet it certainly seems fair when you consider everything it offers. It's really two microscopes in one, but more on that later. Another important feature is the image quality, which I was pleased to find was excellent for a kid's product. It delivers clear, sharp images at the different levels of magnification. Combine that with the easy to use controls and included projects, and you have an educational toy that could hold your child's attention longer than the latest video game. Enough with the suspense. Let's tear open this big white box and show you what I found! You can either read straight through the review or skip to the summary and recommendations section at the bottom. 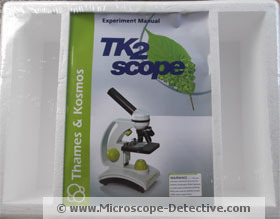 The TK2 Microscope for kids comes in a very nice and professional looking box. Although larger than I expected, it wasn't heavy or unwieldy. The front. I like the cells of the leaf effect. The back. That's a lot of information! Opening the box, which I swear I did not do like an excited child on Christmas, reveals the microscope and all the accessories safely tucked in Styrofoam. Everything is firmly recessed and the whole thing is covered in shrink-wrap. The packaging seemed very secure and the microscope should survive shipping easily provided the box isn't outright kicked around or abused. The manual was a little bent on the top from being so tightly packed, but it was very minor. The manual in the back. Those slides won't fall out, trust me. Like any good microscope for kids, the TK2 scope was a breeze to assemble. 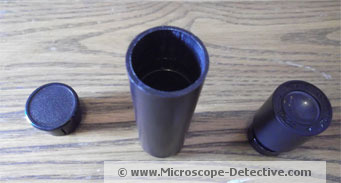 The eyepiece tube comes attached (although you can take it off) with a cap on the end. To assemble, you simply remove the cap and screw in the ocular lens. Before, ocular lens is in the lower left. After, ocular lens installed. Easy! 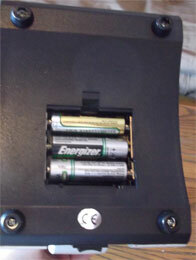 Now just find 3 AA batteries, plug them in the bottom, and you're ready to go. I found the TK2 Microscope for kids very durable, although for once I managed to not test its true limits by fumbling any of the pieces on the ground. The body is mainly plastic but it feels very sturdy and sits perfectly without wobbling. One thing I liked with this model was the built in handle on the side. This makes it much easier and safer to carry, and reduces the risk of accidents by enthusiastic young scientists. You may be wondering what an aperture wheel is. Also called a disc diaphragm, it's simply a rotating wheel that sits under the stage. Located between the slide and the light source, it has different sized holes so you can change the amount of light shining up through the specimen. The smaller holes are for the lower magnifications, while the larger holes are for the larger 400X magnification. Depending on your specimen and magnification level, you may or may not need to use it. It's a matter of experimentation with each new specimen. Science, as they say, ain't no exact science. Overall the construction seemed very good. The objectives click easily into place, everything feels strong and bonded together, and all mechanisms worked well. Although you could perform any number of more complex experiments with the TK2 Scope, the actual product is very simple to use. There are two light sources and thus two "modes" of use. The light can either shine from directly below the specimen as a transmitted light microscope (also called a compound biological microscope), or the light can shine from above as a magnifying glass (also called a stereo dissecting microscope). To switch between these two modes, simply click the button on the back to one side or the other. I used the paramecia prepared slide to test out the compound biological mode with transmitted light. 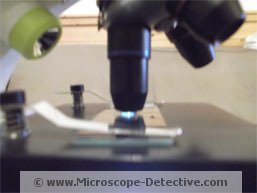 This is how flat slides are commonly viewed with a microscope, with the light coming from below. This is also the mode mainly covered in the manual. The image was very clear with sensitive details. At 40x the paramecia looked like colorful little grains of rice, at 100x the grains were even larger, and at a whopping 400x magnification I felt like I was looking at giant colorful cells. Very cool! Viewing a slide. Notice how the light comes up from below. One thing to keep in mind is that on the highest magnification the objective lens has to be really close to the slide in order to see anything. Parents should demo this for their children and remind them to be careful as you could go too far and break the slide or the lens. This is how close the 400x lens needs to be. Kids should be careful on this setting! Overall the optics were great and this mode was very easy to use. 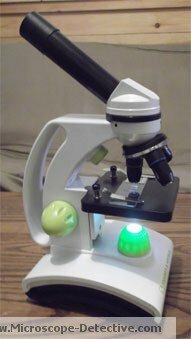 After a quick lecture from parents on how to use the highest magnification, this microscope should be very simple and fun to use for a curious child. 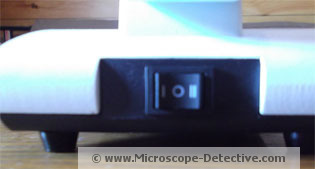 There is another mode to this microscope, with the light coming from above. They call this the "magnifying mode", and you can only use the two lower magnifications while on this setting. This is because the 400x lens needs more light than can reach the specimen when shining from above. This mode is typically used to view 3D objects like coins, bugs, and flowers. I was truly surprised that this mode isn't treated in more depth in the manual, as this microscope for kids is essentially two scopes in one. Yet this mode only gets a few paragraphs in the manual. I tried it out anyway with a makeup brush. It was mildly frightening to see how badly it needed to be cleaned! Use as a stereo dissecting microscope. Time to clean that brush! This is one of my few cons, and it's not even a real con just surprise that a vast dimension of the microscope wasn't explored. Then again the manual is already comprehensive, and the product is really geared more towards biological experiments with slides. Perhaps they wanted to keep the focus there. The two other cons I experienced also didn't feel so much like cons but rather my own failures. 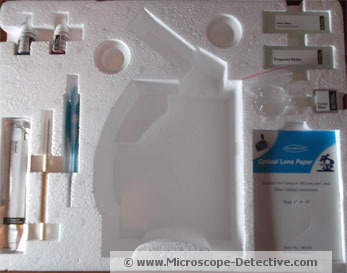 First off, the microscope comes with an "ocular pointer", which is a thin wire with a tip set into the lens. When using microscope, the ocular pointer can be rotated so the tip points to certain areas of your specimen. I should also mention the pointer is extremely lightweight, bendable, and hard to see. The second I took it out it flipped out of my hands and onto the rug, never to be seen again. They do warn you to take it out with tweezers, proving I should have read the manual thoroughly before I started messing around. So please be aware this pointer is exceedingly easy to lose! If you don't want it on the lens take it out as instructed in the manual. A picture of the ocular pointer from the manual. I'd love to show you a live pic but it's currently lost somewhere in the rug. So I'd recommend a little caution when taking the ocular lens off. It can be kind of a pain to put it back together again if you weren't paying attention to how it was set up in the first place. The ocular tube in the middle, the cap on the left, and the ocular lens on the right. Be careful when removing the lens from the tube! Overall these were minor things that could have been avoided had I read the manual more thoroughly before starting to play. So read your manual, folks! Even if you are an adult and think you can figure out anything. Beyond that, the actual functioning of the microscope was top notch. It was fun, easy to use, and produced spectacular quality images. It goes without saying that the scalpel is sharp, and should only be used under parental supervision with younger children. 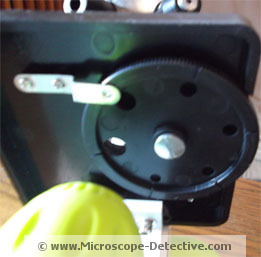 Often a microscope for kids doesn't give you a scalpel at all, so I liked that one was included here. A scalpel shouldn't be dangerous with the proper use and instruction. I thought this was another example of how the makers of TK2 Scope respected the intelligence of the child by giving him or her real tools and not just cheaply made, worthless imitations. As for the prepared slides, the kit comes with sodium chloride crystals, paramecia, pollen grains, and a piece of oral mucous membrane. These are listed in the manual so I'm assuming they're the same for all kits. A final word about the manual. It's awesome. 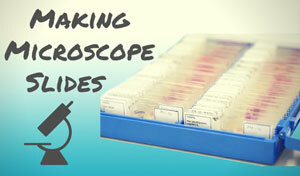 It's not just some 5-page bare bones piece of paper telling you how to use the microscope. It's a 48-page high-gloss instructional booklet that provides an in-depth look at microscopes and microscopy that's fun, fascinating, and not overly difficult to read. This manual is no joke! 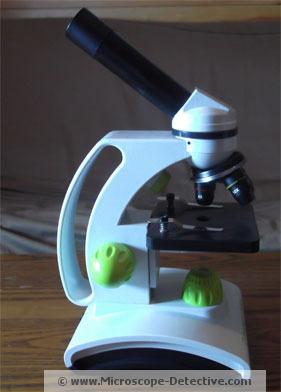 It starts by telling you about the microscope itself and how to use it. Next you're guided through the prepared slides that are included in the kit, and finally you're taught how to make many different slides on your own. This progression of building skills and having fun really helped sell me on the idea that the TK2 scope is an excellent educational toy. The manual itself is worth the extra cost of the kit. As I said in the intro, you could use it to teach an interesting and educational course for kids. It proposed 25 different experiments, all of them worth doing. 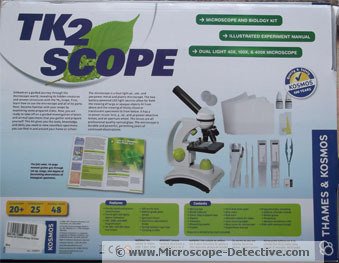 This TK2 Microscope for kids review isn't a free endorsement. 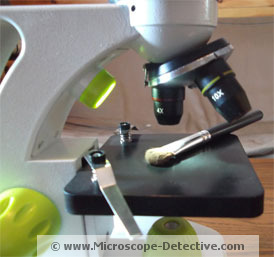 Microscope Detective purchased this kit for me, so we didn't have any contact with the company itself. However, Thames & Kosmos is famous for making science kits for kids, and they have a great reputation. They do give you both a phone number and email address to contact in the manual in the event of missing or defective parts. They also have the same information on their website and encourage you to contact them if something's not working. Overall Thames & Kosmos seems like a legit company that backs up their products. Judging by the quality of the TK2 Scope I would definitely purchase something from them again. Usually retails around $120, a fair price I feel for what is a basic biology course with a microscope included! 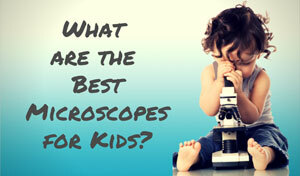 The TK2 microscope for kids is one of the best toys we've tried that's not a toy. Yes it's fun, easy to use, and well made; but it's also a serious product and biology kit that offers hours of fun and learning. I was impressed with the nice images, accessories, sturdy construction, and price considering what you get. I was also really blown away by the manual, which transforms the product from mere microscope for kids to full blown kit for young mad scientists. This is a wonderful kit for the price, with hours of entertainment and education for any developing mind. Something like this can really inspire a kid's imagination while taking them out of the classroom. It gives you everything you need to truly marvel at the world around you. The TK2 microscope for kids was designed for kids aged eight and up, although can be a great fit for all ages depending on their skill level. It includes both delicate and sharp instruments, so younger scientists can use it but parents may want to supervise and edit the kit as needed. 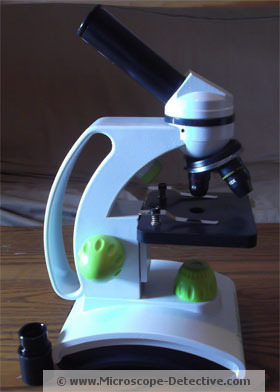 This kit would also work well for any adult looking for a cheap yet functional microscope. Anyone doing low-level lab work or hobbyists would benefit from the great images and ease of use. It would also be perfect someone wanting to look at 3D objects such a stamp collectors, entomologists, industrial workers, or jewelers. 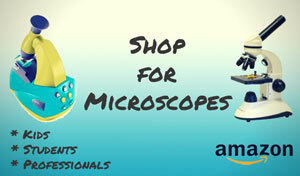 This scope is more expensive than other beginner microscopes, such as the My First Lab Duo Scope. 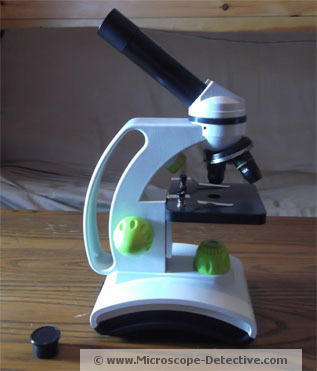 Those looking for just a basic microscope for kids might want to check that one out. However, you definitely get more for the price here, as the manual makes this a biology kit as well. Thus is would be perfect for kids interested in biology, teachers, parents who are home schooling their kids, or anyone wanting to delve deeper into the microscopic world. A fantastic kit for the price. It recognizes and respects a child's curiosity and intelligence. Highly recommended. Now if you'll excuse me, I'm going to go search the rug one more time for that ocular pointer! The TK2 microscope for kids was one of our top picks, but we also gave high marks to the Konus Konuscience Zoom 1200x Biological Microscope.